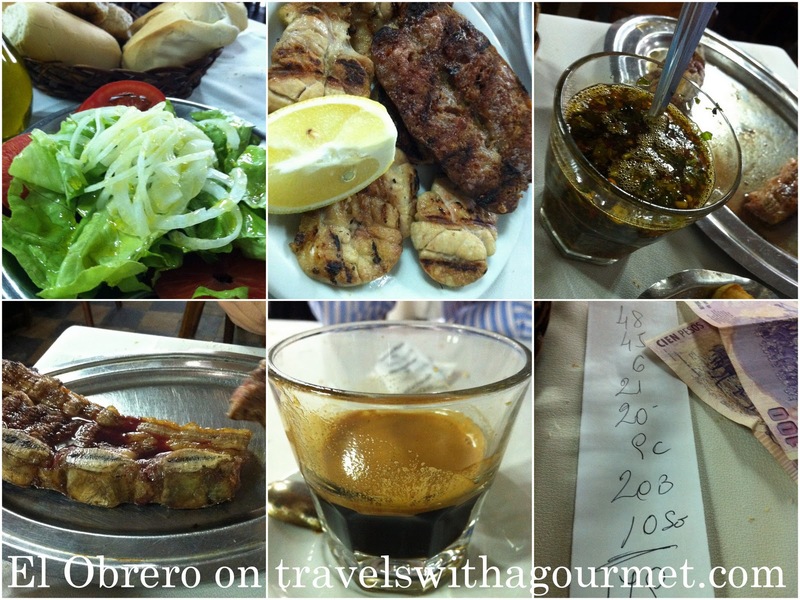 Bodegon El Obrero in La Boca has always been on our list of parilla restaurants to try. 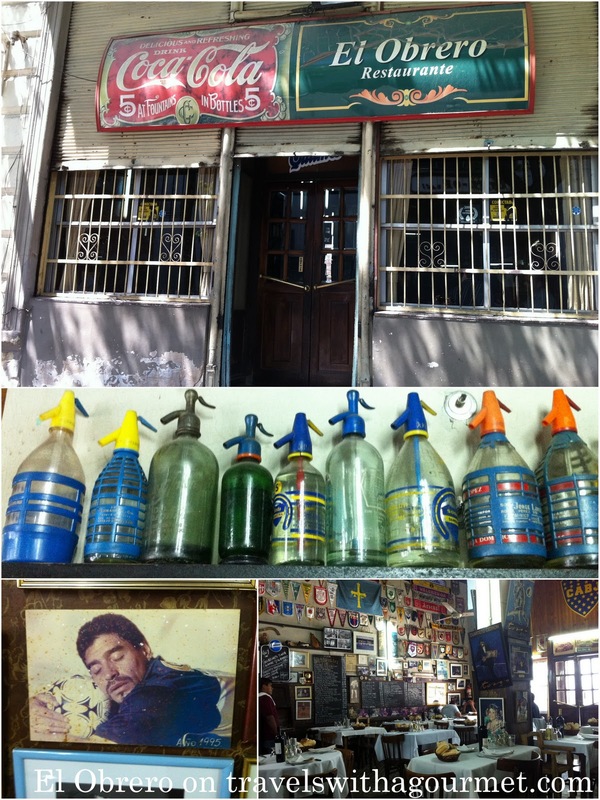 Over the years, we had heard mixed reviews but we were still curious to go there, if only for it’s reputation as being Boca Juniors players favorite restaurant and it’s convenient location near La Bombonera, the iconic football stadium that is Boca Juniors home. Opened in 1954, El Obrero has the claim to fame as being one of the oldest parrillas in town. On a sunny Monday morning, the kids went off with their grandmother and cousin C to Temaiken, a large bio-park showcasing animals in their natural habitats, about an hour’s drive away from the city. We took advantage of the free day to have lunch at El Obrero and finally see what the fuss was all about. The restaurant’s facade is quite rundown and doesn’t really invite passersby to walk in but once you enter the wooden doors, you are greeted by a floor-to-ceiling display of football memorabilia with one wall dedicated to football pennants from other teams and the facing wall filled with framed photos of football celebrities including lots of shots of the most famous Boca Junior player – Diego Maradona. Surprisingly, the place is actually not as scruffy as it seems from the outside with it’s white tablecloths and cozy wooden chairs. The specialties are written on several chalkboards hung on the walls but we were also presented with a menu that had and English translation (a sure sign that the restaurant is now frequented by many tourists) along with a basket of bread. The menu is varied and also includes several fish and seafood dishes which is not typical. After having a look at the standard parilla items, we decided to have share a chorizo a la mariposa (split in the middle and “butterflied” so it cooks all the way through) and our favorite mollejas (sweetbreads) to start along with a simple salad of lettuce, tomatoes and thinly-sliced onions. The starters were served soon after. The chorizo was delicious – spicy, meaty and crispy both on the outside and on the inside and tucked into a split baguette-like roll, it was the perfect choripan (chorizo sandwich). The mollejas were fine but were slice too thickly for our taste (The best mollejas are still at El Mirasol) making the sweetbreads quite chewy. Squirted with a bit of lemon juice though, they were okay. Our shared main course came next – asado de tira, the classic Argentine cut of short ribs (which is like having spaghetti bolognese at an Italian restaurant) which was cooked perfectly and served with fantastic chimichurri (oregano, herbs and oil-based Argentine sauce for everything from the grill). The meat was disappointingly greasy and gristly with not much on the bone. Worse were the accompanying fried sweet potatoes we ordered which were undercooked and hard as coins. We ate what we could and settled for a shared espresso for dessert then waited for our radio taxi (it’s unadvisable to walk around outside and hail a cab on the street). Was it worth the trek to dingy and dangerous La Boca? Not really. After a Boca Juniors winning match though, it might be the place to stop for dinner and celebrate with some die-hard Boca fans.